AMA School of Medicine is a prestigious institution that offers high-quality education in BS & MD courses which is equivalent to the MBBS degree in India. AMA School of Medicine (AMASOM) is the medical school of AMA Education System (AMAES) with two campuses. Its main america.html is in the heart of the Manila city i.e. in Makati and Second campus is in Cavite. It is housed in AMA america.html Makati, which is strategically located at the heart of Makati City, the Philippines’ financial and business capital where the highest concentration of multinational, transnational and local corporations and international organizations and embassies hold their offices. The AMASOM office is at the 8th floor of AMA america.html Makati, which is located at 5486 South Superhighway, Bangkal, Makati City. The Laboratory is the backbone of any medical america.html and AMA has well equipped in house laboratory for practical experience on cadaver and other species. The English medium MBBS programs in China are increasing and today there are 49 Chinese top medical colleges has approved by China Ministry of Education. The approved colleges that enroll international students for the undergraduate medical program in China shall possess the authority to offer master’s degree in Basic Medicine and Clinical Medicine (Primary Level Subject), and the associated hospitals with Grade III, Level A. Therefore for some expand the labs and facilities are much better than almost all of the governmental universities in Asia, Africa and other countries in the world. The faculty of the programs is principally composed of Chinese language professors with doctor or expert levels, who major in Medicine and have experience of learning or working overseas. 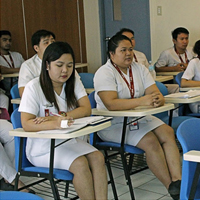 Practical experience is an essential part of your journey to earning your MBBS designation. A very good practical experience will definitely help the students to clear all the exams, like USMLE, MCI and other university examinations. “More practical experience more results”. AMA has well furnished Air condition classrooms with not more than 35 students in a batch. AMA has a one to one practical based education learning system which help students to interact more and more with their educators and solve their many doubts as many as they have. Yash overseas has its own hostel just 10 min walks from the campus. We have a proper management looking after the hostel and students day to day activity. •	Well furnished Ac rooms.